Personally I've been looking at the Suppresors with a bit of excitement. For melee focused armies the ability to prevent Overwatch is nice and Autocannons with -2AP have a decent amount of flexibility to support Primaris armies. Eliminators I see mainly as a way to weaken enemy HQs, or pick off support characters like Apothecaries. They won't drop heavy HQs like Abbadon or Guilliman in a single turn, but taking even a single wound off of him helps drop him that much sooner. Basically Suppressors are a multi tool to support your army with if you don't use mini-Marines while Eliminators need a plan from the moment you put them on the table. Pick a target, keep shooting it until it dies or you do and then move on. Had a game using the Shadowspear stuff last saturday and so far it only confirmed what I've been thinking already. Eliminators are underwhelming if you don't play against an army with squishy characters and Infiltrators are neat for the infiltration but other than that pretty useless so I probably won't include more than one unit of 5-10 once they got a points drop. Suppressors are just generally kinda budget Inceptors so I don't even expect much from them and just take them because I like how they look. The Vanguard Librarian did good work with the half-movement power though! Re: Infiltrators, you were happy enough performance wise to plan on taking a unit going forward though? Im really interested in taking 5 with the helix adept in the traditional scout role (since I don't have them). Edited by PeteySödes, 15 April 2019 - 05:41 PM. I'm not a tournament player so I don't always just take things that are strong. Having an infiltrating unit I can throw at whatever makes games more interesting, that's the only reason why I'd take a unit. If they were actually good I'd take more. Not sure if you can take the Helix in such a small unit. The wording currently allows the Helix only in addition to the base 5 models or in a unit of 10 models depending on how you read it. I'd love taking one in a small unit though. You totally can, "may include up to 4 additional and infiltrators and a helix adept", 0 is not above 4. Given the cost atm I wanted to keep the it down a bit but still get the utility. I'm excited to field them asap. Edited by PeteySödes, 16 April 2019 - 02:25 PM. That would still mean a unit size of at least 6. 5 base + the Helix. Otherwise it would say that you can upgrade one Infiltrator to a Helix. Maybe i need more coffee but i dont see how that would not allow me to do that. 1 infiltrator sgt, 4 infiltrators and the helix adept. Totally legal based on the datasheet. Sure, thats what i meant really. Just differentiating the helix from the 5 baseline guys. We're talking about the same thing it seems. The suppressors cost 33ppm, just like the cheapest hellblasters. They have same toughness/wounds, considerably more range, always 2D (not just when overcharging), always 2 shots (not just at <15"), but lower strength and AP. 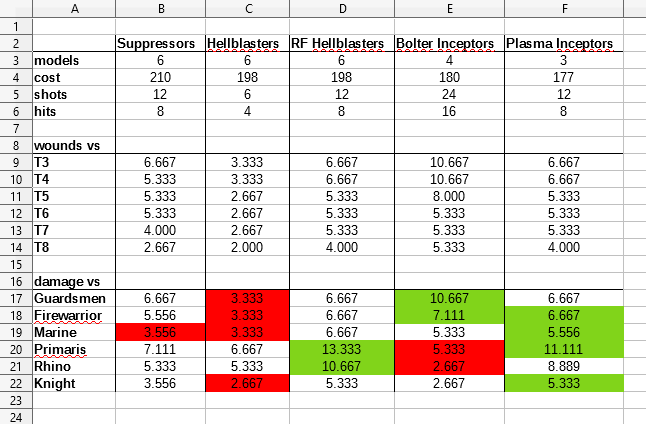 Except for T8 and targets with good armour but no invul, suppressors do slightly more damage if I remember my calculations correctly, but have more range than any other primaris infantry. It becomes even more interesting when you compare it to Inceptors as well. So we see that Suppressors are pretty much always better than Hellblaster at >15" except for against Marines and regular tanks. However they are also pretty much always worse than either Bolter Inceptor, Plasma Inceptor or Hellblaster in RF range. Now that's just the bare numbers and there are of course other things to think about as well. For example it's much easier to keep Suppressors in aura range of characters than Inceptors or Hellblasters, their added mobility over Hellblasters which they share with Inceptors, the added durability per points over Inceptors despite their T5 due the Inceptors expensive weapons, the tendency of supercharging Plasma to overheat (and eat ~4 shots in an Inceptor squad), the random number of shots for Plasma Inceptors and so on. However I think it's fair to say that they are neat allrounder that bring some more meat to the table than the more dedicated Inceptors. If we end up with a bigger max unit size for them we should definitely play them in bigger units (or just multiple smaller units) since their damage output per model is comparably low. Special shoutout for the ability to take away overwatch from (mostly) infantry units in case there are melee units in your list and also the Sergeants ability to throw smoke to protect the unit while the rest of the unit can keep shooting unlike it's the case with Infiltrators. That's the point - everything that is usually more effective also has to be within 18" or less of its target. That in itself is a problem in my experience, because any surviving enemies nearby are in CC/rapid fire/grenade/pistol range and ignore RG's -1 to hit due to proximity. Midfield weaponry of neighboring units can open up too, making it a bit comparable to the suicide melta squads of classic marines. Suppressors are in a rather singular position as they maintain peak efficiency up to 48", and reduced efficiency at 60", which comes closer to devastator squads than the mentioned suicide meltas. They can shoot constantly from the first turn on, while inceptors are not yet on the board and hellblasters are not yet in RF range, offsetting their lower output to a degree. The other way around, a large percentage of weapons can't touch them yet, as the suppressors can deploy out of range of most anti-infantry weapons. Last but not least, they can damage enemy backfield units as long as they remain alive, instead of being rather limited in range like the remaining primaris line. So yes, there are more efficient options for taking out a limited number of high value targets, especially those without invuls. In contrast, these guys can constantly add to the weight of fire while being a rather unappealing/inaccessible target with lower priority. With the right threat management, these guys can fire with impunity for most of the game, making them a usable option, even if they are not the destroyer of worlds. If Suppressors go 3-6 and keep that only the sarge loses shooting for smoke their value will go up too. So instead of 2/6 not shooting only 1/6 will.